I started by making my go to regular pancakes. I got the recipe from my Aunt Teresa. I have made a slight adaption to the recipe by using whipping cream and milk. She made cookbooks for everyone several years back. On the recipe it says from BH Cookbook so I am guessing Better Homes and she has used this recipe since 1981. It is a really good recipe! 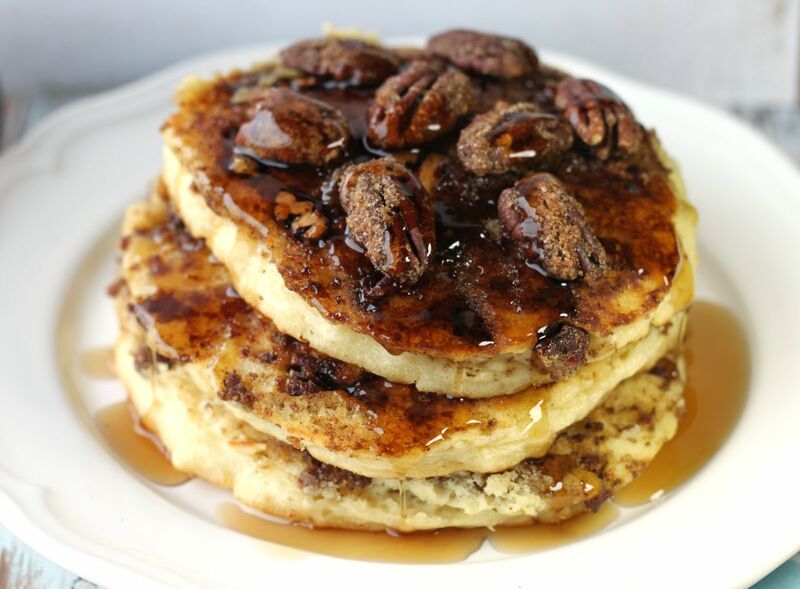 I put the pancakes on the griddle and on the top side I sprinkled them with the praline pecan crumbs and push some chopped up praline pecans down into the pancakes. I flip them over and let them finish cooking. I stack the pancakes on my plate with the praline topping side up. Then lay more praline pecans on top before I drizzle them with syrup. I use an adapted recipe from Gimmie Some Oven for my praline pecans. The only thing different I do is omit the pepper. You can use store bought praline pecans or click here for the recipe I use. Combine egg, milk and oil and add to the dry ingredients. Stir just until moistened. Bake on hot griddle. 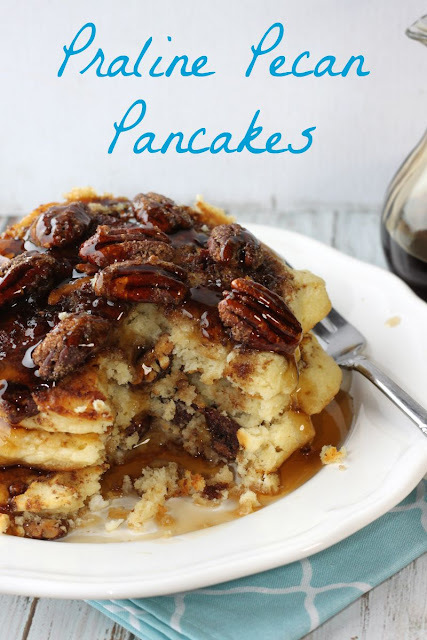 Place about 1/4 cup pancake mixture on griddle and sprinkle top of pancake with praline crumbs, or cinnamon sugar also pushing some chopped praline pecans down into the pancakes. Flip when the underneath side is done. Continue cooking until pancake is done. Stack pancakes on plate with the praline pecan side up. Put more pecans on top and cover with syrup. These look so sinful and amazing! What a delicious breakfast for a cozy day at home! Oh my these look great - the perfect weekend breakfast!